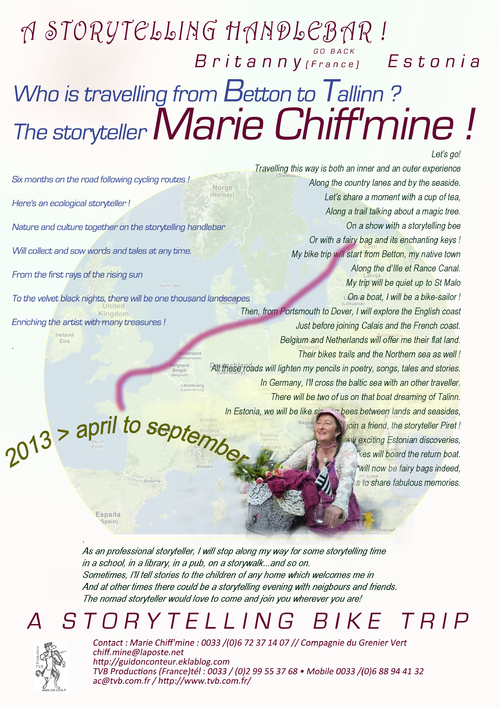 Bonjour Marie, We hope you arrived at your destination yesterday (Tuesday 7th may 2013) after leaving you at the start of the Billy trail on Hayling Island. Today has not been very nice weather we hope you did not get too wet. Take care and good luck with the rest of your journey. Thank you for tha friendly message. Yesterday was the day of cycling guides . At the end of the billy trail, I ask somebody my way, just to be sure on the right way. And he was my second guide of the day, stopping on the way to tell me a few words about the landscape and so on ! And then, he left me on the right road for Emsworth . I was lucky because that man of seventy six years old knew fairly well the cycle routes of that area. I had good cycling up to Chichester where I got lost with the cycling routes...I asked to cyclists (they are best information agency!) I asked the way to get Bognor Regis and they shouted at me...come with us, we go to Bognor regis....I shouted : Thank you very much, you are my luck ! And there, they invite me to their place for dinner and night ! Nice meetings for that day ! I was lucky with all those guides ! Thank you and welcome to Britanny ! All of you were like fairies on my way of storyteller ! Tonight I'm in Rollingdean after the busy town of Brighton. I should meet the seven sisters on my way !